The world is now eagerly awaiting the GigaPower internet service and Google has already announced its plan to introduce 1 Gbps internet in 9 more metropolitan areas in the USA. And now after Google AT&T is in the queue with a vision of providing 1 Gbps internet speed to 21 US metropolitan areas. 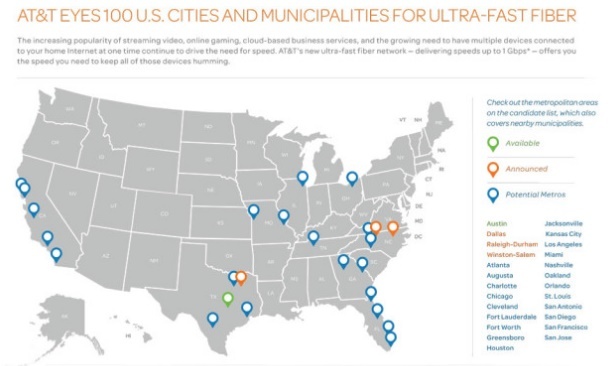 In a recent press conference AT&T revealed that it would be providing GigaPower internet in a total 100 cities including Atlanta, Augusta, Charlotte, Chicago, Jacksonville, Cleveland, Fort Worth, Greensboro, Houston, Fort Lauderdale, Kansas City, Los Angeles, Miami, Nashville, Oakland, Orlando, San Antonio, San Diego, St. Louis, San Francisco, and San Jose. Google fiber internet is already there in Kansas City and will go live in Provo, Utah and Austin, Texas later this year. Currently this high speed internet of AT&T is available in small areas of Austin and Texas and will expand to Dallas, Raleigh-Durham and Winston-Salem, North Carolina in coming days.